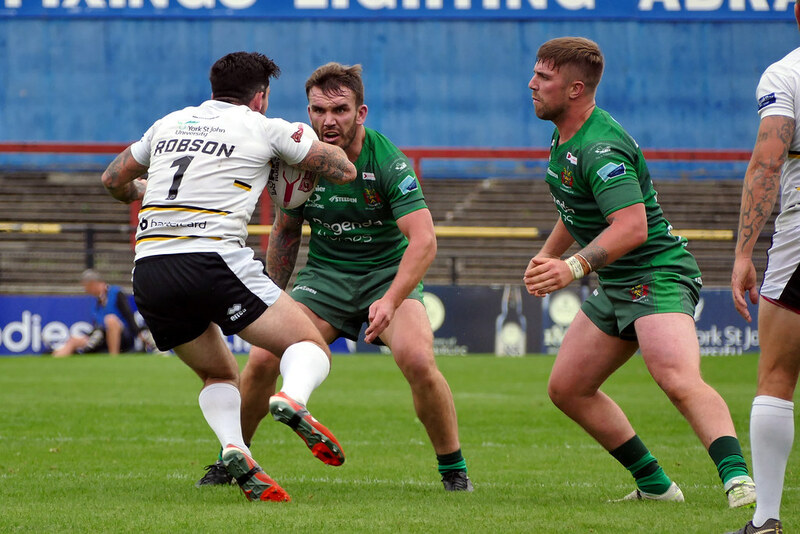 ​DESPITE a massive team effort at York, and a narrow 10-6 defeat, Oldham are still hanging on to the fourth and final play-off spot in Betfred League 1. 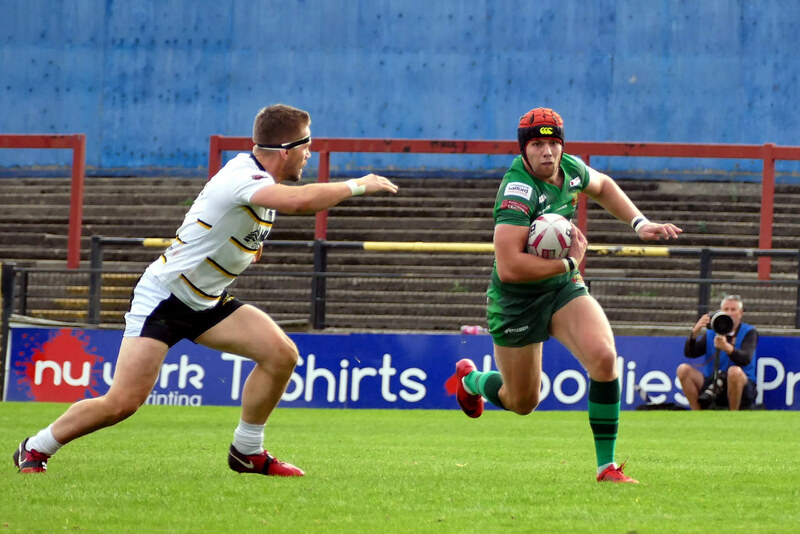 Whitehaven did us a favour by beating Hunslet up in Cumbria, but there are now three teams on 30 points and barring major surprises Oldham, Whitehaven and Hunslet will all be battling it out for one vacant spot with two games to go. Such is our hugely superior for-and-against record, however, we are sure to qualify if we beat Bradford at the Vestacare Stadium next Sunday and then take care of London Skolars down in the capital on the following Saturday. It’s a massive ask . . . but York officials were mightily impressed with our battling qualities at Bootham Crescent and went so far as to predict an Oldham win against the Bulls next week. It’s a must-win game for both teams and a season-defining one for the Bulls, who will see York take the title and automatic promotion if they fail to beat Scott’s boys in what should be an absolute humdinger. It couldn’t be any more gripping though than this mighty battle at Bootham Crescent between two of the best defensive sides in the competition. Oldham were ‘nilled’ in the first half; York were ‘nilled’ in the second half . . . and that, as much as anything, tells the story of a massive, 80-minute arm-wrestle in which first-half honours went to York and second-half gongs were earned by Roughyeds. Scott’s boys got stronger and more dominant the longer the game went on and so much were they on top in the last quarter that you got the distinct impression that with another ten minutes to play with they would have pulled it off. 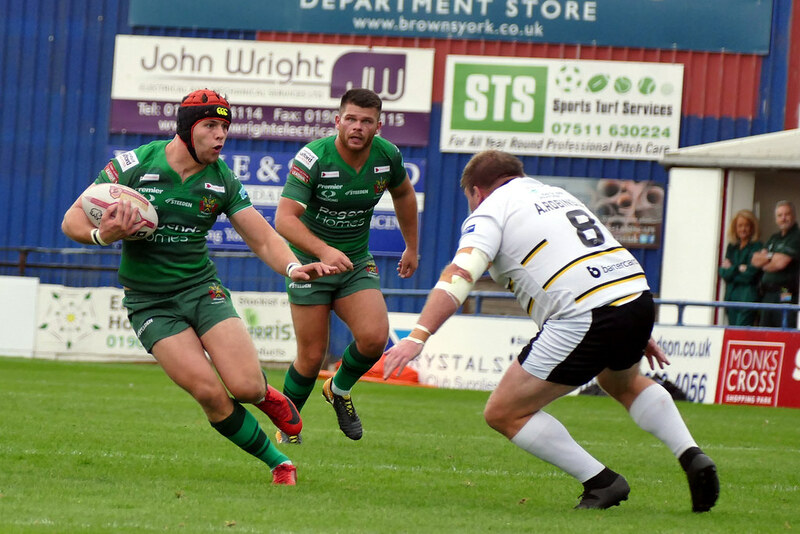 York fielded the side that won at Workington last week; Scott pulled in Kyran Johnson on the wing, Dave Hewitt at half-back; Matt Reid at centre and Liam Bent at loose-forward, while restoring Gareth Owen to his usual spot in the middle of the front-row. 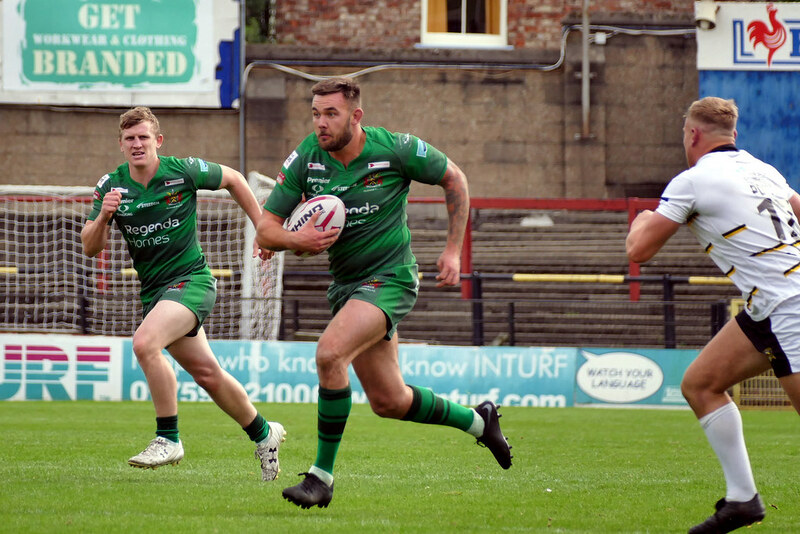 Over the 80 minutes there was little to choose between the sides, but those of a Roughyeds persuasion in the crowd were left to wonder how much more dominant the visitors would have been if they hadn’t made a dozen or so mistakes in possession. They erred constantly throughout the game while the Knights dropped only one clanger in the whole of the first half, although a few more did creep into their game as fatigue took charge in the later stages. In the first few minutes Connor Robinson and Ben Coackayne peppered Lee Kershaw with high kicks and the youngster took a couple of them brilliantly under pressure before fumbling the third. The chase was always good and on this occasion Sam Scott was left with the simple task of hacking the ball on and touching down near the corner. Robinson, the division’s top marksman, put his touchline kick wide. As the rival packs hammered into each other you could feel the intensity and cut the atmosphere with a knife. 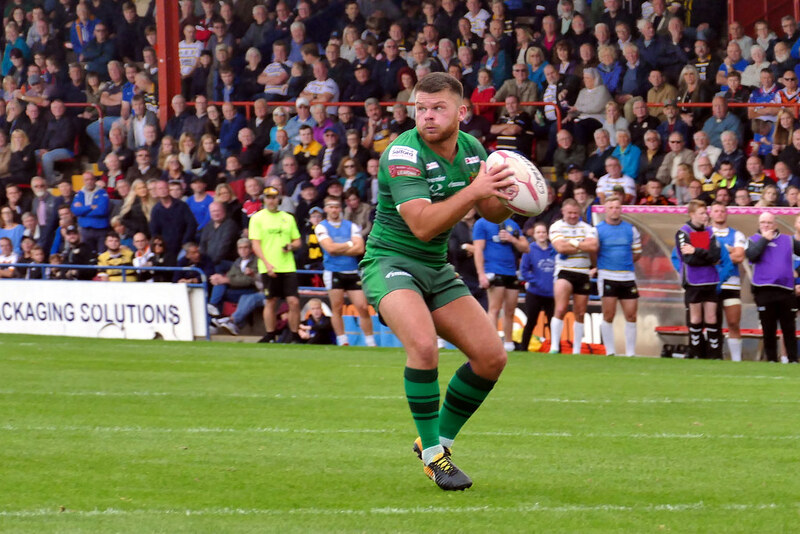 Roughyeds fans were heavily out-numbered in a crowd of nearly 1,700, but they relished the challenge, made themselves heard and did their club and their town proud. The players responded with a gutsy, magnificent effort that frightened the life out of York fans and, long before the end, had them checking their watches anxiously and longing for the hooter. Oldham had a let-off when Cockayne went clear only to be hauled back for an obstruction. At the other end Hewitt stepped left and right as he went for the line on the last tackle, but his final pass went astray. Earlier, Tim Spears won a penalty for holding down and Robinson kicked an easy goal or a 6-0 lead. It was nip and tick after half an hour but York then increased their lead when Aussie sub Jack Edwards offloaded intelligently in the tackle to send the supporting Connor Robinson over in the corner. He failed to improve his own try and then, from the restart kick, Cockayne and Joe Porter contrived to mess things up between them to give Oldham unexpected possession deep inside the home half. In the run-up to half-time Roughyeds were camped out on the home line but despite back-to-back sets and loads of pressure they couldn’t break down a cast-iron defence. Paul Crook, who had taken a knock didn’t emerge for the second half. Owen took his place in the halves with Matty Wilkinson operating at dummy half and doing a fine job in taking his side forward from behind the play-the-ball. He went agonisingly close to scoring a couple of times but as Oldham turned up the gas exchanges became tetchy and both sides were lectured for slowing down the play-the-ball. As Oldham captain, Owen was spoken to a couple of times, while York were penalised four times in a row and put on a team warning. Oldham were gradually getting on top and a quick right-to-left shift featuring Wilkinson and Hewitt saw the supporting Luke Hooley scampering clear to the corner. It looked a perfectly good try, but it was ruled out for obstruction — a cruel blow for the visitors who were now playing with more freedom and putting the Knights under serious pressure. Leading by example and urging his troops forward, captain Owen was quick to react at a poor York play-the-ball but was penalised for not being straight. While Kershaw’s strength and direct running caused York problems on one flank, Johnson’s quick feet, nimble stepping and speed off the mark had them worried on the other wing. He was amazingly quick to respond to loose ball situations too and it was his intervention that led directly to Wilkinson being held up over the line. Oldham then moved the ball right where Owen and Hooley handled with speed and precision to send a gleeful Jack Holmes over with nine minutes left. Hooley goaled from right of the uprights and at 10-6 it was anybody’s game. 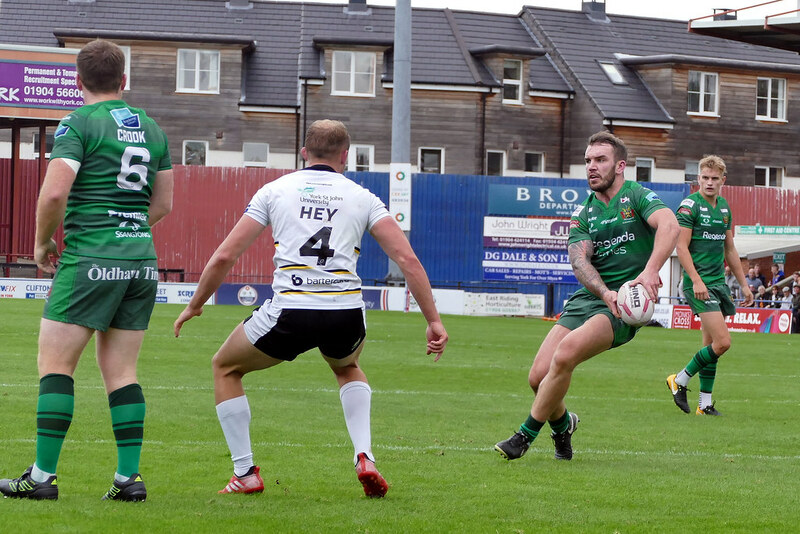 With the minutes ticking down York were anxious to get a breather whenever they had the opportunity and Robinson obliged with two or three touch-finders to drive Oldham back into their own half. Oldham somehow got down to the other end where a vital decision went against them after a Hewitt bomb. In the melee that followed York appeared to knock-on, but Oldham protests were waved away before Wigan referee John McMullen ordered a last-tackle turn-over. The game was equally as tough, unrelenting and gripping as the one at the Vestacare Stadium early in the campaign . York won by two points there and by four points here . . . fine margins indeed ! York — goal, C Robinson; tries, Scott, C Robinson. York: Marsh; Robson, Batchelor, Hey, Oakes; Cockayne, C Robinson; Dixon, Ellis, Horne, Jordan-Roberts, Scott, Spears. Subs: Carter, Edwards, A Robinson, Porter. Oldham: Hooley; Johnson, Holmes, Reid, Kershaw; Crook, Hewitt; Neal, Owen, Joy, Briscoe, Langtree, Bent. Subs: Spencer, Wilkinson, Davies, Jones. Ref: John McMullen (Wigan); Att: 1,692.